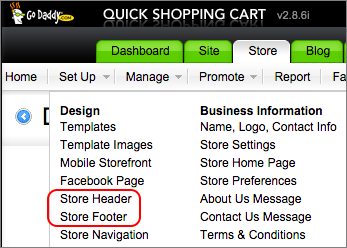 From the Set Up menu, in the Design section, click Store Header. Note: If you're adding tracking code for Google Analytics, click Store Footer and follow the rest of the steps below. Google recommends using the footer to keep the tracking code separate from whatever else might be added to the header. In the Create the Storefront Header section, use the provided default text or enter your own message in the Header text box. You can also include any or all of the variables from the Variable list. Note: Click "(Reset)" to remove the current message and display the default message. To clear your header, delete all text in the Create the Storefront Header section. The following code is an example of the HTML text that would be used to enable the company logo and information, such as address, phone number, and email address, to display in the storefront header. Copy this code and overwrite the default code provided in the Header field.